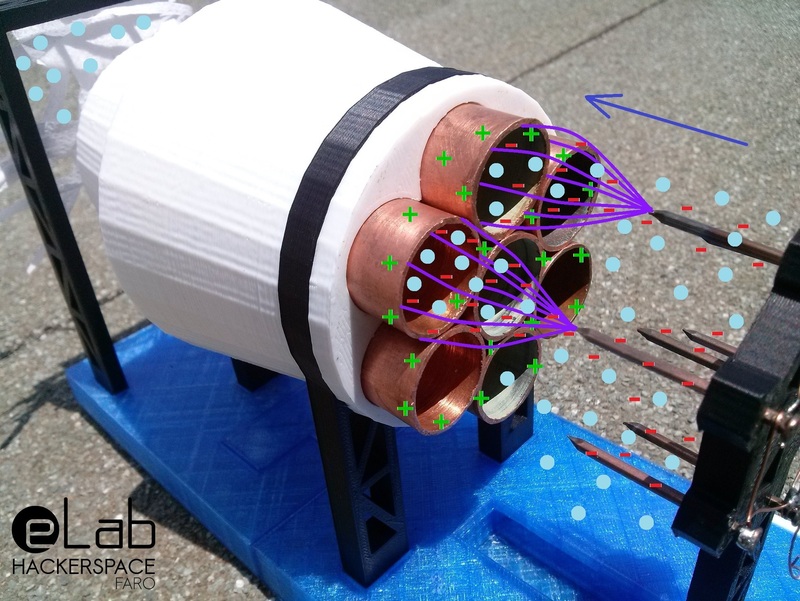 The project isn’t exactly an efficient engine, but more of a scientific demonstration of the ion thruster working principle. That said, it won’t launch of the table but it will create a steady flow of air without using any moving parts, which is interesting. 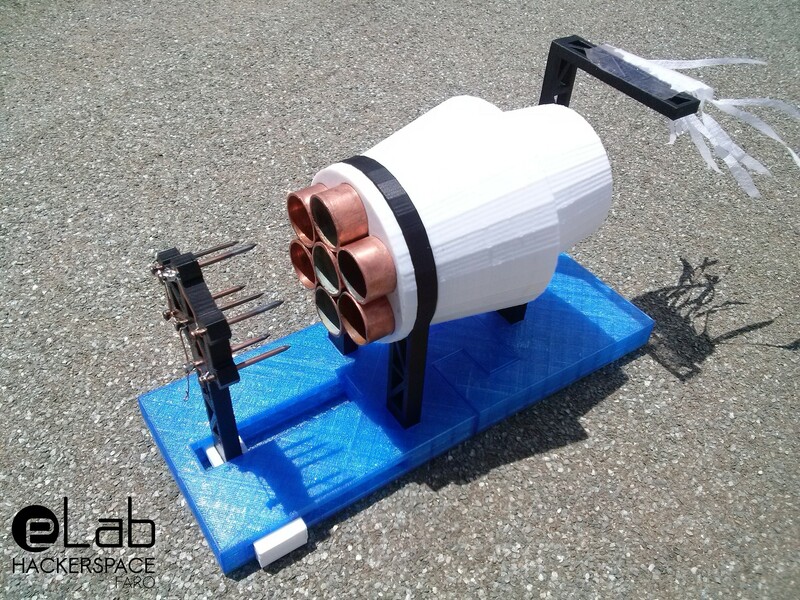 In terms of materials the project is quite straightforward, all you need are some nails, copper tubing or couplings, an high voltage power supply, wires and something to build the structure. 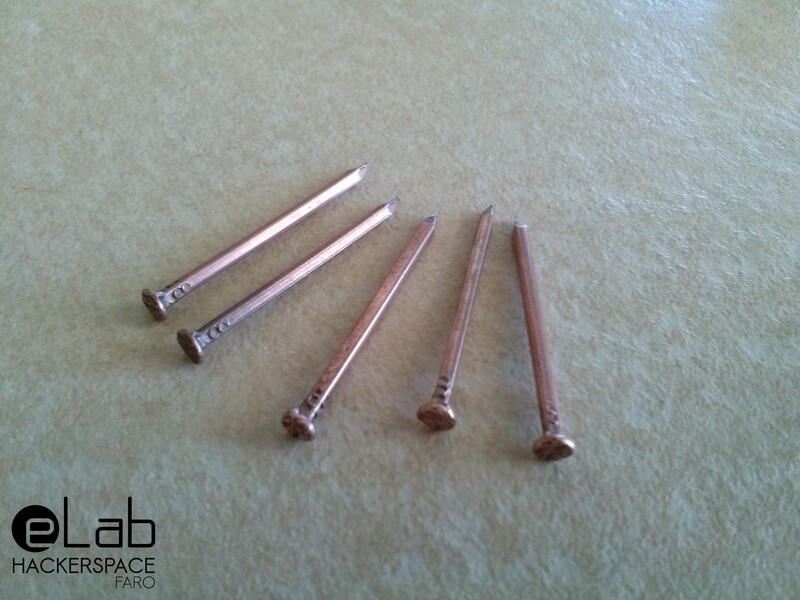 Alexander suggests the use of copper plated nails, which I presume is to increase electrical conductivity. There are many ways to do that, personally I used a very simple method I found on instructables, which only uses some old oxidised copper coins, salt and lemon juice or vinegar. So, I grabbed some iron nails and cleaned them up with a wire wool to remove any oxidation. 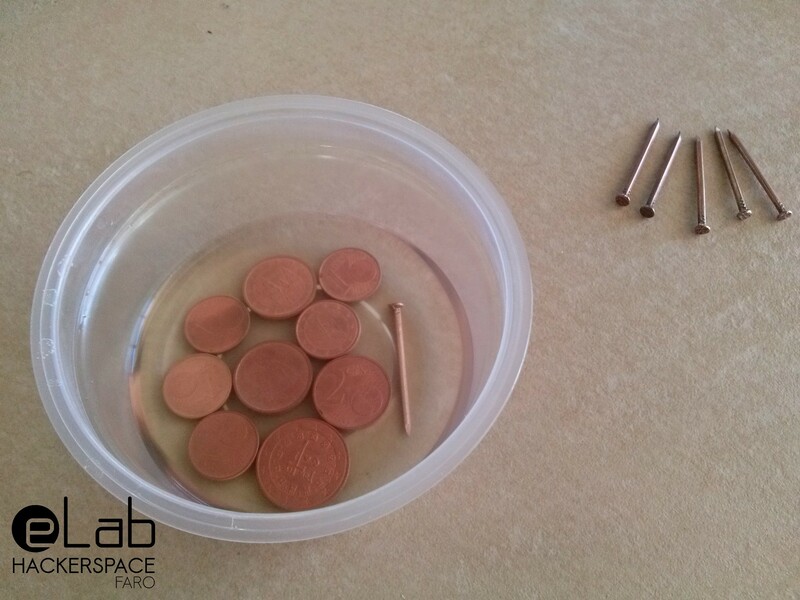 During the process you might need to replace the coins, because this works best with oxidised coins. During the process they will loose that layer of oxidation and the process stops working. It’s also a good idea to add more lemon juice or vinegar and salt every once in a while. 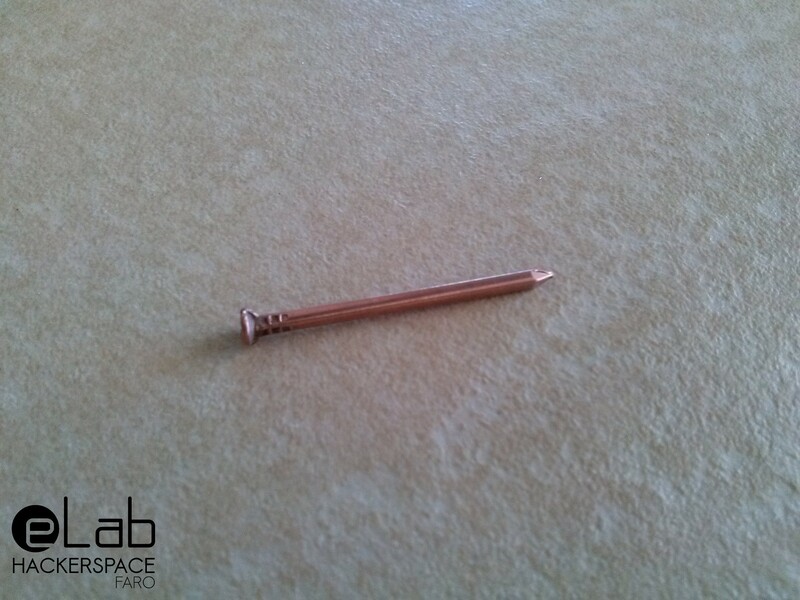 Keep in mind that this method only adds a very thin layer of copper to the nails, so any scratch will easily remove it. 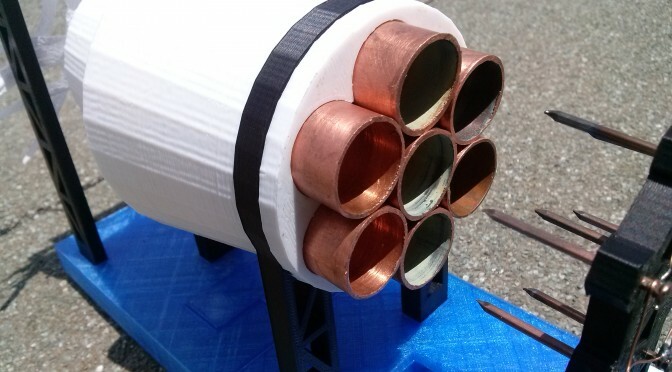 For the tubes, I used an old copper pipe with a 2cm diameter and cut it into 5cm pieces. So I used Tinkercad to design the entire structure. 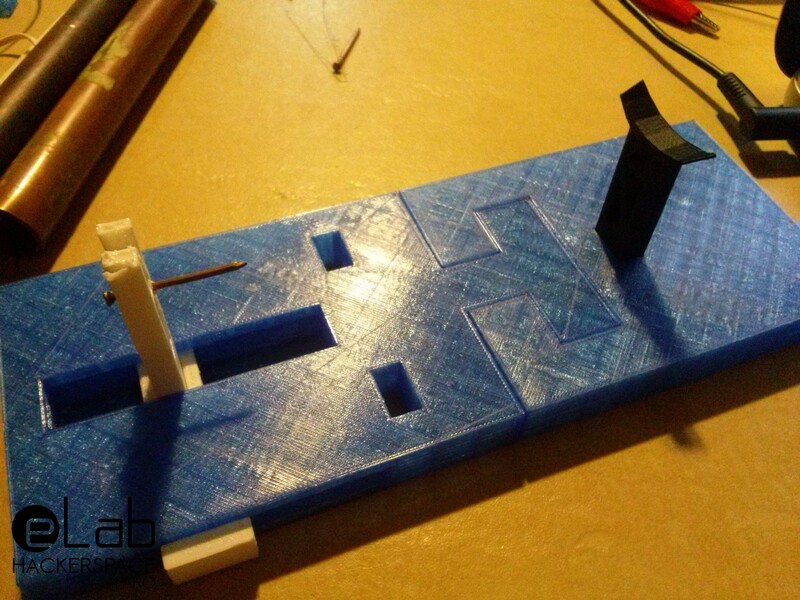 If you want to build your own, I made all parts available on Thingiverse. Even though I used a large 3D printer like the TAZ4, I’ve made sure all parts are small enough to fit most printers. For the high voltage supply, I had an extra NST (Neon Sign Transformer) from my Tesla Coil, so I used that. It has a 9kV, 50mA output. Be very careful working with high voltage, you must know what you’re doing, because it can kill you! It’s possible to use other HV supplies, like a flyback transformer from a CRT or something like that. And it was working great! Eventually I had all the parts printed and it was finished. I even added an emergency button to fire up the transformer, which always makes everything more exciting! This will create almost invisible tiny beams of plasma. As the ions reach the tubes, the charges will be attracted to them but the neutral particles already gained momentum, creating a steady flow of air. There are several things that have influence on the efficiency of the system, for example, the voltage applied to the electrodes, the precision of the placement of the nails on the center of the tubes, making sure all distances between them are the same, perfect cut tubes, having the surface perpendicular to the nails, and of course the distance between the electrodes, which must be put right before it starts creating an electric arc. By the way, even though I designed the structure with a slider to adjust the distance between the electrodes, don’t ever to it with the power supply on, it’s way too close to the electrodes and it can be very dangerous. So be sure to turn everything off before adjusting the distance through the slider! 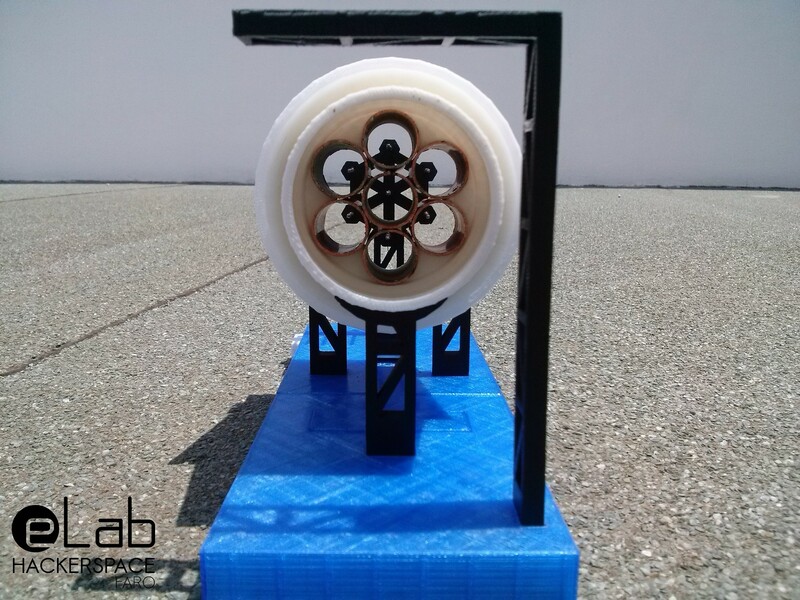 I had the opportunity to take this project to Lisbon Maker Faire 2015, for which it was awarded the prize “Best in Class” of science! Now just a small note, in space there is no air to ionize, which means this project, as it is, wouldn’t work, so how do they do it in space probes? Well in space it’s injected a noble gas like xenon, keeping the spacecrafts from using solid fuel, making this method more efficient and more appropriate for longer travels. But still, the working principle is still the same! High Voltage transformers are very dangerous! Don’t try this yourself if you don’t know how to work with high voltage safely! What power supply are you using? My NST has open circuit shut off immediately and will not run the ion thruster I built. Hey Tim, we’re using an old NST without open circuit protection. The newer models will shut off with this project configuration. You’ll need to find an older NST or any other HV power source without that protection mechanism. Do you think it would be possible to modify a newer NST to disable the GFI protection? I already bought one that came WITH the protection long before I had any idea that it would be a problem. Hey Daniel, a few things I need to say. First, when working with high voltage, you should always be very careful, and control things at a safe distance and the proper safety equipment. Regarding the GFI protection, I don’t think we mention that in the article. I don’t see a problem using a NST with GFI protection, besides, the one we have, actually does have ground wiring. We even use it connected to a safe ground rod, to safely discharge the electrodes after we turned it off. You can even notice the ground wire in some of our pictures. So yeah, ground protection should and must be there for your safety. I think you might be talking about something else though, which is the open circuit protection. That is indeed a problem, since the project works on an open circuit configuration. 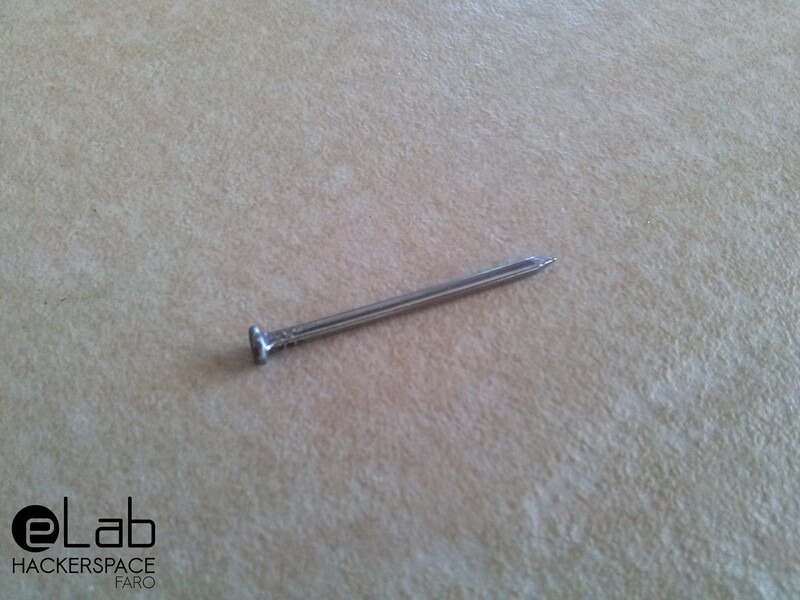 Older ferromagnetic NSTs are tough and durable, so they can take it. Electronic NSTs will most likely die if they are forced to work in an open circuit, so they have a protection for that. Regarding modifying the transformer, I honestly don’t know, because I haven’t done it. Older NSTs are basically heavy transformers enclosed in resin or some other insulator, so opening them will probably destroy them. The newer ones, I have no idea. If they are electronic, there is probably a way to disable it. But I’m just guessing. Thank you so much for your information. It was actually my understanding that ground fault protection is a form of open circuit protection. I’m not positive on that though. At any rate, I’ve decided just to buy an older model of NST, just to save myself the trouble. Thanks all the same! No problem! Ok great! Yeah that is probably the easiest solution. Hey! Thank you. But be careful with it, high voltage is lethal, you should probably ask for someone’s help dealing with it. Is 230V enough for this experiment…? Is it possible to decrease the size of each electrode configuration and multiplex them for higher thrust output? I have no idea. You could try using multiple different configurations to test if it improves efficiency. Would it be advised to put hand behind paper to feel the air movment? No! 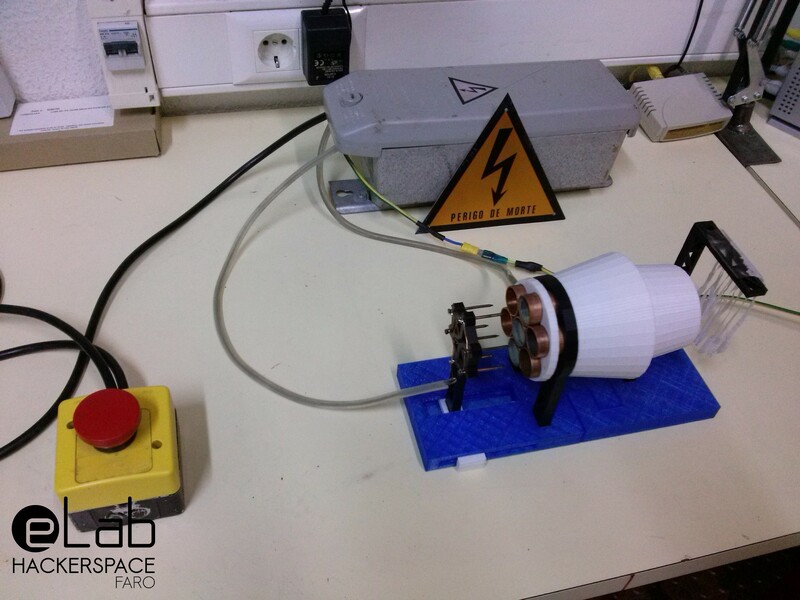 You should never approach the Ion Thruster while it’s operating, it’s high voltage, so it can be very dangerous. Remember that depending on the voltage, an arc can be created from different distances. .Do you think a 3.7V-6V to 400kV Dc step up power module would do? NSTs cost a bomb here in India. Thanks! Well I’m not sure at all, you definitely need high voltage in a wide acceptable range, but the current might influence the operation as well. As long as it would have similar current capabilities, i guess it should work. Anyway, I would at least, give that a run test to see what happens. 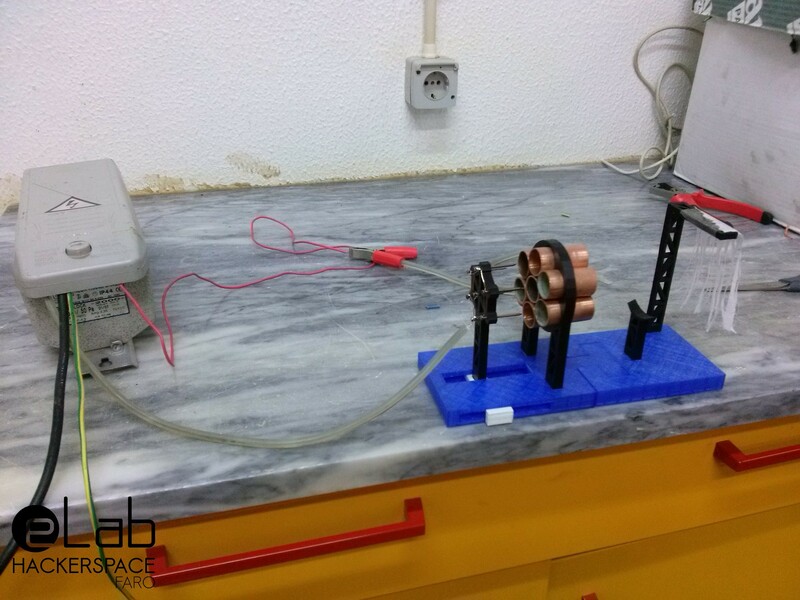 The most expensive part is the NST transformer, but if you can salvage that from an old neon sign for example, the project becomes super cheap, just a piece of copper tube, some nails and 3d printed parts (which can be made from wood).